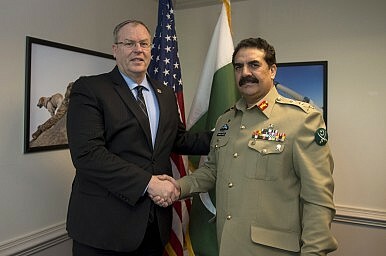 With Washington’s patience and money fading, is time running out for Pakistan’s offensive against domestic terrorism? Royce and Engel’s concerns stemmed from Pakistan’s muted response to a Taliban attack on a school in Peshawar last December, which left almost 150 people dead. But just hours after Kerry received the note, events in Pakistan continued to inflame that argument. On February 13, three Taliban assailants hurled grenades, exchanged gunfire with police, and detonated a suicide vest at a Shia mosque in Peshawar, leaving 20 dead. The fundamentalists continued their attacks on February 17, when a suicide bomber blew himself up in a crowd of people in Lahore, killing five and injuring dozens more. But aside from the rhetoric, which has remained strikingly similar for the past eight years, what is Pakistan doing to fight the insurgency in concrete terms? Pakistan claims it has killed more than 2,000 militants since the offensive began in June, sustaining just 129 casualties of its own. Operations in North Waziristan and Khyber Pakhtunkhwa have pushed militants from Al Qaeda, the Islamic State, and the Islamic Movement of Uzbekistan over the border into Afghanistan, where they’ve struggled to gain a foothold, clashing with Pashto-speaking tribes in their attempts to force civilians out of their homes. Meanwhile, Pakistan’s military has gotten more adept at fighting insurgents from above: bombings in the Datta Khel area destroyed a terrorist hideout in January, killing 35 insurgents. Those efforts have been abetted by strikes from American predator drones, which have already claimed the lives of 27 militants this year. Islamabad continues to disavow that support, but seems to understand the gravity of the stakes in North Waziristan: the Zarb-e-Azb offensive has been bolstered by a surge of 170,000 troops on the Afghan border, almost a third of Pakistan’s entire military. Islamabad’s tussle with militants has claimed the lives of over 4,400 troops since 2002, nearly twice the number of American casualties in Afghanistan. While doubts about Pakistan’s commitment to the fight remain, there’s no underestimating Islamabad’s war weariness. That fatigue won’t subside any time soon. Even if Pakistan can manage to get the insurgency under control, it could very easily regroup in Afghanistan or elsewhere. Eastern pressure from India, Pakistan’s military arch-rival, provides a constant distraction from the Western front, despite the resurgence of shuttle diplomacy surrounding the 2015 Cricket World Cup. But if Pakistan wants help from the U.S. or anyone else in fighting the scourge of terror, they would do well to hurry up. Congress isn’t the only place where patience is waning: aid from the Kerry-Lugar-Berman act, Washington’s cash pipeline to Islamabad for counterterrorism operations, has dried up. Kerry promised another $250 million in January, far short of what’s needed to sustain a full-throated counterinsurgency operation. With President Obama increasingly looking towards Delhi as his chief partner in South Asia, Islamabad may be running out of time to take the fight to Islamic militants.